The Intellitec flush mount fuse blocks are the ideal answer to the problem of installing a fused distribution panel in a vehicle where a finished look is demanded. The fuse block provides spaces for up to 12 automotive type ATO fuses. The fuses are divided into two groups of six fuses. 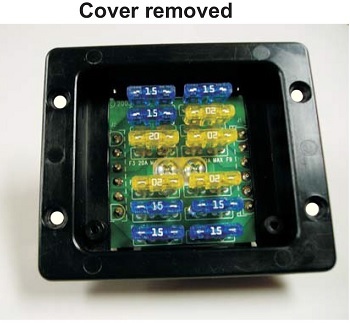 The fuse block comes with a snap on cover that when in place hides the fuses, fuse puller and the mounting screws. The power from the source is fed into the block via two collar-clamp connectors on the board. The connections to the loads are made through two, 6 pin Mate-N-Lok connectors to make installation easy and fool-proof. 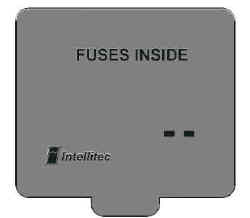 Intellitec’s Flush Mount Fuse Block is intended to provide fused 12 or 24 volt power to a group of accessories in a vehicle. Power is fed into the Block from either a single or dual input connection (depending on the model) and is distributed to each of the twelve fuses. Load connections are made through AMP Mate-N-Lok connectors. Maximum Continuous Carry Current: 100 Amps total Max. 15 Amps per Circuit Max. Maximum Ambient Temperature: 185 Degrees F.
Minimum Ambient Temperature: -40 Degrees F.